PARIS --- The joint venture company announced last night by Italy’s Fincantieri and France’s Naval Group is a modest step towards the integrated military shipbuilding group that the French and Italian governments have been calling for, and is initially limited to two joint programs for both countries’ navies. It however falls well short of the very ambitious plans for an integrated group as initially envisioned by the French government, and kept alive largely through its determination to create a “naval Airbus” intended to bring benefits to both countries. Such a project, however, seems totally unrealistic, and this was tacitly acknowledged by the wording of both government and industry statements issued Tuesday night, and which describe a cooperation that is limited to two bilateral naval programs. More critically, it does little to reinforce the two companies’ capabilities to withstand competition from Chinese and Russian shipyards, which was one of the original reasons for the tie-up. One modest step forward, however, is that the two companies have agreed to cooperate on the international market, and to avoid competing with each other for the same export contracts, as is now rather embarrassingly the case for the Brazilian Navy’s procurement of 12 new Tamandaré corvettes. That is a significant advance, but given the fact that Australia and Canada both opted to buy the Royal Navy’s future Type 26 frigate, the decision by France and Italy not to compete with each other seems beside the point. Some sources claim that Naval Group and Fincantieri have agreed to jointly bid for the Dutch Navy’s frigate replacement contract, but this has not been officially confirmed. The new joint venture will benefit from France’s decision to build four logistic support ships based on the design of the Italian Navy’s Vulcano-class fleet oiler. The agreement signed today by the two countries’ national armament directors calls for Fincantieri to build the tank sections of the French ships in Italy, which will be assembled in France by Naval Group and the Chantiers de l’Atlantique. Although all details have not been settled, it is unlikely that the industrial benefits will be more than lowering the price of the French tankers which, while welcome, will not change the face of Europe’s naval shipbuilding. Another joint project is the Mid-Life Upgrade of the French and Italian Horizon-class frigates, for which the two companies have agreed to submit a joint offer based on a common Combat Management System (CMS) they will develop together. An initial offer is to be submitted to the French and Italian navies in 2019. However, despite a profusion of management-speak catchphrases in the joint communiqués issued separately by the governments and the manufacturers (see following items below), the plans announced Tuesday fall far short of what was initially envisaged: a single company that would avoid duplication and pool the most cost-effective shipbuilding assets of the two groups. Initial plans to establish cross-shareholdings between Fincantieri and Naval Group have disappeared, as has the idea of “a naval Airbus” that seems to be the obsession of successive French governments who cannot understand that building airliners does not affect national sovereignty in the same way as naval shipbuilding. Furthermore, while the future joint venture company is limited to surface combatants, as well as systems and equipment, both governments will build their future generation of frigates separately, France with its Frégate de Taille Intermédiaire (FTI) and Italy with the Pattugliatore Polivalente d’Altura, the first two of which have already been laid down. This is a marked regression compared to the previous two generations of major surface combatants, which France and Italy jointly designed but built separately: the Horizon air-defense frigates and the FREMM European multi-mission frigates, so the new roadmap can hardly be described as an advance. - corrected name of Italian Navy's new logistic support ships, which are the Vulcano-class. The Italian and French governments welcome the announcement made by Fincantieri and Naval Group, according to which the discussions held since the Franco-Italian summit in Lyon on September 27, 2017, have led to the development of a detailed industrial and business plan as well as a roadmap that will capture the mutual benefits of this plan, giving priority to surface vessels, systems and equipment. The two governments support the key initiatives that Fincantieri and Naval Group intend to implement rapidly, and, in particular, the establishment in 2019 of a 50/50 joint venture, whose objective is to implement commercial and industrial synergies. These measures must improve the competitiveness of the Alliance's offerings on the world market, and enable them to continue to meet the needs of the Italian and French navies with the most modern solutions. The industrial alliance proposed by Fincantieri and Naval Group will have no impact on the ability of each government to master the capabilities and strategic resources of each of these companies. The two governments have initiated discussions on a government-to-government agreement, which will help to streamline collaboration between Italian and French manufacturers, and provide a clear and simple framework for the operations of the alliance, both nationally and internationally, on the export market. At the 34th Franco-Italian Summit held in Lyon on 27 September 2017, the French and Italian governments announced their intention to facilitate the creation of a more efficient and competitive European shipbuilding industry and to reinforce their military naval cooperation by initiating discussions with a view to establish an industrial Alliance between Fincantieri and Naval Group. 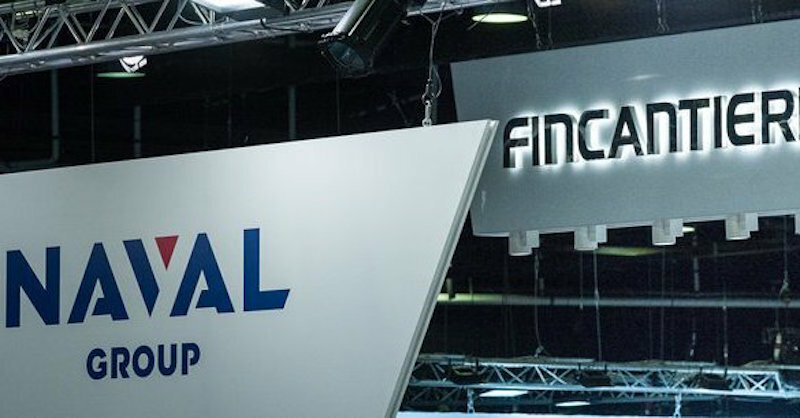 Fincantieri and Naval Group worked intensively since this date and submitted their proposal for such an Alliance in July 2018 to the competent French and Italian Ministers, encompassing an industrial project and its envisaged roadmap, along with a description of the key initiatives, which they propose to launch rapidly. Acknowledging the declaration of support by the French and Italian governments, and subject to each company’s Boards of Directors’ approval, Fincantieri and Naval Group are ready to concretely launch the Alliance in particular with the aim of setting forth the terms and conditions for the incorporation of a 50/50 joint venture. The establishment of this JV represents a first step towards the creation of the Alliance. -- To encourage cross-fertilization between the two companies, with sharing of testing facilities/tools and expertise networks. As of today, Naval Group and Fincantieri have already engaged in a common industrial collaboration to provide the French Navy with four logistic support ships (LSS), based on the design of the Italian Vulcano LSS. Furthermore, as of 2019 and with the support of both Ministries of Defense, Naval Group and Fincantieri contemplate to present a common offer for the first studies for the Mid-Life Upgrade of the French and Italian Horizon-class destroyers with a common Combat Management System (CMS). A Government-to-Government Agreement would be needed to ensure the protection of sovereign assets, a fluid collaboration between the French and Italian teams and encourage further coherence of the National assistance programs, which provide a framework and support export sales. Fincantieri and Naval Group consider that this Alliance represents a great opportunity for both groups and their eco-systems, by enhancing their ability to better serve the Italian and French navies, to capture new export contracts, to increase research funding and, ultimately, improve the competitiveness of both French and Italian naval sectors. Fincantieri is one of the world’s largest shipbuilding groups and number one by diversification and innovation. Headquartered in Trieste (Italy), the group has more than 19,000 employees, of whom more than 8,400 in Italy, 20 shipyards in 4 continents, today Fincantieri is the leading Western shipbuilder. Naval Group is the European leader in naval defense. The Group designs, produces and maintains submarines and surface vessels. It also provides services for naval shipyards and bases. In 2017, the Group generated revenue of €3.7 billion and had 13,429 employees.